Difference between revisions of "What's in IAM"
Below are the changes, bug fixes and note worthy features of IAM for each release. 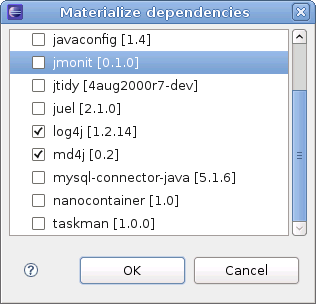 Dependencies declared in a workspace project <tt>pom</tt> can be checked out in the workspace using their ''scm'' information. When editing pom.xml files, values for the GroupId, PackageId and Version tags when adding a dependency are available. This feature uses the Open Artifact Search Framework outlined below. This is available in the ''Maven 2'' context menu for the project. No need to mvn install the dependencies on the workspace when running maven goals. The most current version is always used. This means that you can modify a project on your workspace and use it in the surefire tests of a different one depending on it. Instantly. The profile view allows for quickly enabling and disabling profiles when running maven. New extension points allow third parties to develop and register search engines for their indexing solution. Several implementations are bundled with the install so you can use it out of the box. It is possible to have maven mojo projects on the workspace and haven them used by q4e. The archetype catalog xml format used by the archetype 2.0 plug-in can now be used with q4e for selecting an archetype in the New Maven Project wizard. This format is used to register an internal catalog by default, which replaces the wiki provider (although it can still be manually added). Edit POM files in a form based editor that synchronizes automatically to the pom.xml file in both directions. Also allows you to see the parent POM and the effective POM. Automatic synchronization of J2EE project dependencies from maven dependencies for war projects. All your dependencies in the workspace will be available when running the project on a J2EE server. Dependencies declared in a workspace project pom can be checked out in the workspace using their scm information. This is available in the Maven 2 context menu for the project.